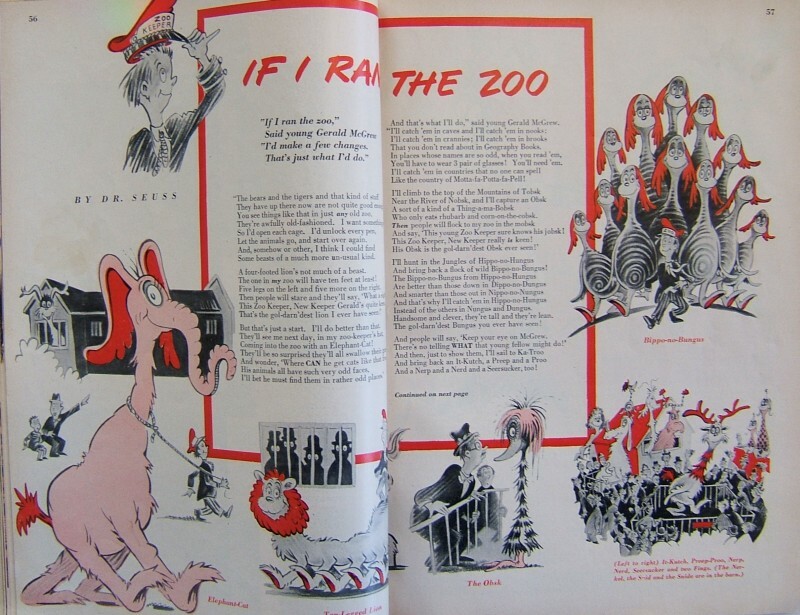 In a previous post, we provided the first edition identification points for Dr. Seuss’s If I Ran The Zoo. The key identifying point is the absence of the line "Based on Material Originally Appeared in Redbook Magazine" on the copyright page. The true first printing of the book omits this line. "I’d make a few changes, that’s just what I’d do"
"And the fellow who runs it seems proud of it, too." "I’d make a few changes, that’s just what I’d do…"
The Redbook includes illustrations of many of Seuss concoctions featured in the book, including the Elephant-Cat, the Ten-Legged Lion, the Obsk, the Bippo-no-Bungus, It-Kutch, Preep-Proo, Nerp, Nerd, Seersucker, Fings, and of course the giant Gwark. 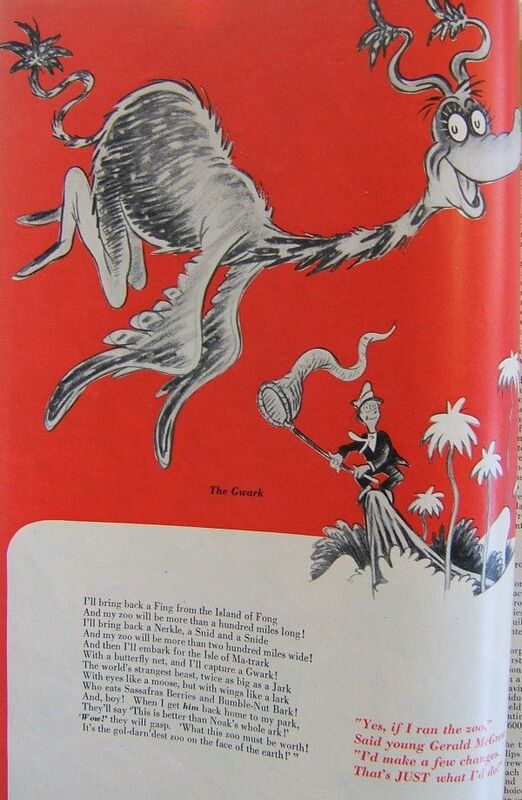 The Redbook illustrations are unique to the magazine–Seuss re-did each illustration for the book. The ‘look’ of the creatures are very much the same between the magazine and the book, although curiously, the ‘facing direction’ is reversed in the book, i.e. if left facing in the magazine, the creature is right-facing in the book, and vice-versa. A Nerkle a Nerd and a Seersucker, too!" These same lines appear in the magazine, which was published prior to the book. So, if you are a ‘pop culture technophile’, the magazine might be the more appealing. It certainly would be less expensive to obtain, since the first edition If I Ran The Zoo has a market value of $1600 (in very good condition) according to the Children’s Picturebook Price Guide). Gerald McGrew, the principal character and narrator in If I Ran The Zoo, is the first of several McGrew’s to appear in Dr. Seuss works. Young Mayzie McGrew is the principal character in Daisy-Head Mayzie, and her parents are Mr. & Mrs. McGrew. We do not know if they are related to the Zoo‘s Gerald. A Dr. McGrew appears in You’re Only Old Once! at the Golden Years Clinic. And, lastly, a Mr. McGrew appears in Seuss’s I Can Draw It Myself, as a man who needs whiskers, "some eyebrows and eyelashes, too"